Pitsford sits in a green and tranquil triangle of rural Northamptonshire enclosed by a series of major thoroughfares. To the east runs the A508, to the west the A43, both joining the A14 to the north (the road that links the M11 and A1 to the M1 and M6). The network of roads is close enough to provide easy access to this gem while leaving the peaceful banks that make this water such a favourite to the attention mostly of anglers and birdwatchers. Pitsford has long boasted a reputation for its wonderful top-of-the-water fishing and even in the most difficult conditions there are usually a few fish to be found rising in sheltered areas. The natural feed is rich even throughout spring, which makes fishing with nymphs effective right from the start of the season. In fact, the clear water usually makes a more imitative approach the most successful at any time of year. One of the most effective methods from the bank is to fish a team of buzzers on a floating line and long leader. Most of the aquatic insect groups are represented, from buzzers and caddis to small upwinged flies such as pond and lake olives. Damselflies and dragonflies are also to be found, especially in the shallower, weedier areas, as are corixids or water boatmen, which can provide good fishing later in the year. In the right wind conditions, daphnia too is blown close enough to the bank to bring the fish within range. The reservoir is divided into two ‘halves’ by a causeway supporting the Brixworth to Holcott road, which provides the only access to the fishing lodge and boat dock. It is a great water for the bank angler as its narrow profile and numerous bays and points provide mile upon mile of accessible and productive water. With so much space, Pitsford is rarely crowded except for the first few weeks of the season and even during early summer, when fishing is at its best, there is plenty of scope for the escapist fly fisher. Because of its contours, the water can be fished in most wind directions, though the most difficult is one blowing from a westerly direction. The fact that Pitsford lies pretty much in an east/west direction ensures that when there is a stiff west wind, finding a comfortable spot with some protection is not easy. Along with a plentiful stocking of rainbow and brown trout, there is a good head of coarse fish, including pike, perch and roach though the specimen rudd, which at one time could even be caught on fly, are now few and far between. Instead, the pike have become more numerous, with many now being caught purposely on the fly. This area fishes well right from the start of the season. With trout stocked from the causeway, they run right along the North Fields shore and can be caught along its entire length. The most effective tactics include nymphs on a floating line to small lures and tadpoles fished on an intermediate or slime line. The bottom here is quite stony and, with water 6-8 ft deep well within casting range, there is no need to wade until the water recedes later in the year. 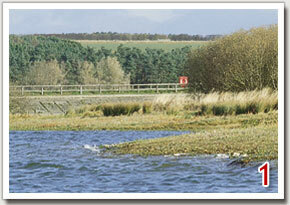 Being so close to the causeway access is easy and it is a popular spot for evening fishing during the summer. A popular spot close to Stone Barn Point is the bank directly in front of North Fields Bungalow. Although it fishes well throughout the season, it is a popular spot early in the season as it is only a short walk from the causeway. It has a clean bottom and the right depth of water – 6-8ft within casting range. Sinking lines and lures such as the Green Pea or the Booby work well. Later in the year, when natural food such as caddis, buzzer and corixids become more plentiful, it is a great nymph fishing spot on a South Westerly breeze. Due to the depth of water, wading is not necessary but if you are tempted, beware the drop-offs, especially when the water is coloured and they are hidden. This is one of the best-known locations on Pitsford and a real hot-spot throughout the year. Even when other areas of the reservoir are proving difficult, Stone Barn Point is normally good for a fish or two, even if there is nothing in the bay or along Stone Fields shore. As such, it is a very popular spot and can get a bit crowded. Wading is easy and allows perfect access to a good depth of water, making it a great early-season spot It also produces some very good fish, the best last season being a rainbow of 10lb 14oz. Being a point, it can be fished either side depending on the wind direction, though a South or South Westerly are the most comfortable for casting. Most tactics work with sinking line lures such as the Minkie or Booby, best early on, and nymphs on a floater as the water warms and insect activity increases. Being sheltered, this area can fish well right into the bay itself and is well worth fishing right from the off. The Gravels, not surprisingly, have a gravel bottom and the fishing can be patchy as it is rather featureless and lacks the weed required to support the invertebrate life the trout are looking for. The Grange Farm area is normally more productive and fishes well throughout the season to a variety of tactics, with a small lure or caddis larva imitation such as Stickfly the most effective during the first few weeks. A South or South Westerly breeze provides the most comfortable casting, though the area also fishes well on a light Northerly. Either way, the wading is relatively easy but because of a small drop-off is better as the levels recede. This section of bank fishes well throughout the year and is a great favourite with Pitsford regulars. However, it can only be reached by a long walk from the Pitsford Creek car park so doesn’t get a great deal of fishing pressure. The bottom is quite muddy and there are extensive areas of weed, which support all kinds of aquatic life. Early-season buzzer fishing can be absolutely brilliant and from late spring into early summer a floating line, a long leader and a team of buzzers produces some wonderful fishing. Later on in the season, damselfly nymphs also form a big part of the trout’s diet and a slowly-fished imitation can be deadly. Though the bottom is muddy, wading is actually quite good but often there is no need. The fish will tend to cruise up and down the length of Serman’s and will often come in very close, so wading can be counter-productive. The Holly Tree bank extends directly from Serman’s and though it has a very similar bottom and water depth, the addition of a series of small bays provides the angler with a few additional options. Early season Buzzer fishing is, again, very good and because of its position it fishes very well on a light to moderate South Westerly wind. 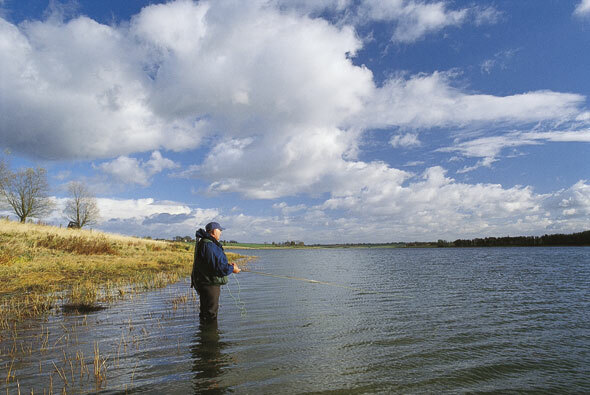 Wading is good but as the fish tend to run well into the shallow water, it is a good idea to fish the margins thoroughly before getting your feet wet. Always pay attention to the small bays, too, especially the points, casting at an angle of 45 degrees to the bank rather than straight out. Standard nymph tactics work well with pattern such as Buzzers, Diawl Bach and Hare’s Ear particularly effective. During the summer months, there is often an evening rise when flies such as the Silver Invicta and Wickham’s Fancy are worth a cast. Often also known as the ‘End of the Pines’ due to a line of conifers stretching out towards the point, this area forms one side of the mouth of Pitsford Creek. As it sticks well out into the reservoir, it offers easy access to deeper water with 8-10ft reached by a good cast. Along with the point itself, the small bay to the right of Rigby is also well worth fishing. Because of its profile, Rigby Point can be fished effectively in a variety of wind directions. A South Westerly is very productive while during the summer a light Westerly can be tremendous, as huge numbers of hatching insects are blown across the point. Lake olives in particular can induce a great rise and are even to be found hatching off as early as April. It fishes very well throughout the season and is also a well-known big-fish spot, regularly producing specimens in the 5-6lb class. With its V-shape profile, Pitsford Creek can be fished productively in a wide range of conditions as there is always somewhere that is reasonably sheltered even in a due Westerly. In a rare North or North Westerly breeze, the creek works like a funnel and anything that is hatching is concentrated in a small area. Although the Rigby Point side of the creek is quite stony, the bottom becomes muddy further into the creek. One spot often worth a cast or two is Table Bay, situated opposite a small picnic table. The water is quite deep, which means wading should only be attempted with caution. It is an area which fishes well throughout the year and is one of my favourite big-fish spots, producing both rainbows and browns in the 4-6lb class. It also holds its fair share of recently-stocked fish which, having been released at the Yacht Club, quickly work their way along the dam down the bank and into the Creek. Situated to the left of the Yacht Club, access is extremely easy from the nearby car park – you need walk only 50 yards to be fishing. Although it fishes well throughout the season, it’s a great early-season spot sheltered from the prevailing South and South Westerly winds. In fact, apart from a straight Easterly, it can be fished in most conditions. The bottom is quite muddy and you can’t wade far before reaching the drop-off. However, the combined mud and weed growth holds prolific numbers of invertebrate life such as buzzer, hoglice and caddis, so nymph tactics catch plenty of fish at any time of year. Lures such as Tadpoles also work well, but be prepared to lose a few as the area holds a few jack pike. Further out of the bay, along the straight, can also fish well as it accesses deep water, but I don’t advise wading here. A good early-season spot that fishes well right through the season, Brixworth Bay is accessed by a ten-minute walk from the Yacht Club car park. Particularly at the mouth, the water drops away quickly so wading is inadvisable though further into the bay, towards the Three Willows, the water is shallow enough to wade. In parts, the bank has been badly eroded forming small cliffs, which some anglers prefer to fish from rather than getting closer to the water. The Bay supports a healthy population of aquatic insects such as damselflies, caddis flies and buzzers, with the fishing for corixid feeders coming into its own later in the year. It fishes well in a range of wind directions. A North Westerly is fine and a light South Westerly works too, providing a nice fishing ripple that brings food in toward the margins. Situated on the left-hand side of Brixworth Bay, North Shore point provides access to water 8-10ft deep, making it ideal for early-season lure fishing. Because of the deep water, wading at this spot is not necessary and the fish can often be found quite close in, especially when swarms of daphnia are being blown toward the bank. The water is often so clear that the daphnia can actually be seen but in such conditions fishing can be difficult and the area is most productive during the evening. Early and late in the season, sinking lines with Tadpoles and Boobies work well. Later, when the trout are feeding on more natural fare, caddisfly imitations and patterns such as the Red-Ribbed Holo Diawl Bach and Hare’s Ear Nymphs are most effective. Because of erosion, the Cliffs are now protected by a gabion wall of large stones encased in a thick wire mesh. The water in front is quite deep and at top level you can be casting into 11-12ft of water. For this reason, the Cliffs fish best early and late in the season, tapering off towards the middle of the season. However, by the end of summer the corixid feeding can be especially good. Long casting is not necessary as the fish will often work close in and, because of the steep drop-off, wading is all but impossible along the entire length of this section. Although the Cliffs can produce some good trout, it is also a noted place for very big pike around the margins. Another very consistent spot, the short section of bank known as the Gorse fishes well throughout the season. Although it is quite straight, it does stick out into the reservoir so it is possible to fish in 10-12ft of water. This makes it ideal both for fishing lures and deep buzzer early in the season. The Gorse continues to fish well into the summer, producing some very nice rainbows around the 5lb mark. The localised hatches are also very good and on a summer’s evening expect to see plentiful numbers of caddis flies and buzzers, plus the not-so-welcome caenis, or angler’s curse. Bottom feeding is also very good and with prodigious numbers of hoglice crawling around on the lake bed. A deep-fished Hare’s Ear Nymph is especially effective. Being so close to the car park at Bog Bay, this location is very easily accessed, which is probably why it is so popular. Even with such a degree of pressure, it still comes up with the goods, producing both recently-stocked fish and some superb grown-on rainbows into double figures. The water in front of the point of Stilton’s is around 6-7ft deep, making it an ideal nymph fishing spot. Further into the Bay, the water is shallower and the bottom more silty, though it isn’t too soft to allow wading. What the silt does is support huge numbers of buzzers, and the trout feed heavily on both the larvae and the pupae. For this reason, Bloodworm and Buzzer imitations are particularly effective. So named because it is very close to the causeway where trout are stocked. It’s not a great spot but because freshly-stocked fish run along it, there are always a few fish to be caught. It is where many beginners learn to fish. It is also quite shallow so fast sinking lines are rarely used. The bank can produce some decent fishing early and late in the day, when there aren’t too many members of the public to interrupt bank fishing. Nymph and lure tactics both work well, though if you are intending to fish always watch your back cast – if you don’t, you might catch more than you bargained for. One of the few decent bank fishing spots in the small half of the reservoir. Unfortunately, the water this side of the causeway is often quite coloured but, when it is clear, May Tree Point can fish very well. However, there is often an abundance of fresh stockies that have run through the tunnel of the causeway. The water here is not very deep and because of the rushes that line the margins, wading is essential. Even though the wading is easy, don’t be tempted to go too far – the edge of the rushes is fine. Early season, a floating or intermediate line is quite adequate, with patterns such as the Black Tadpole, Green Pea or Black Buzzer the most effective.